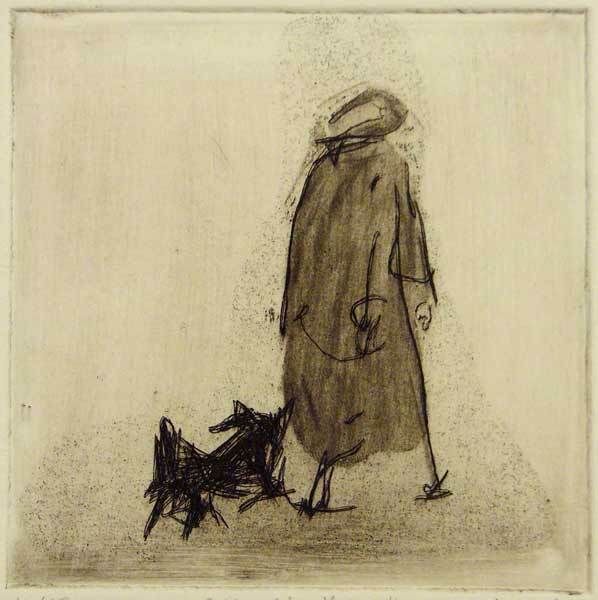 This small etching is based on one of the street sketches I used to do, sitting in the window of my shop. Lots of people pass by our window all day long, with their dogs, kids, bags, zimmer-frames… One must be really focused to be able to catch the essence of the image – a very good practice, which I admit to neglecting for a long time now. Because the subjects are here one second and gone the next, one must be very quick and economical. Somehow, it forces the artist to be exact and expressive. I really must get back to it. Very well-edited and informative video clip. Mezzotint is one of Intaglio printmaking techniques. Strictly speaking, it is a drypoint, as the image on the plate is formed by roughening the surface of the plate and then smoothing some areas, as opposed to incising the metal in engraving, or biting with acid in etching.